Editor’s Note: This article is part of a series in which the PBS NewsHour and the Organisation for Economic Co-operation and Development, or OECD, explore how health care and health policy in OECD’s 34 member countries compare with the United States. Below, Francesca Colombo, an OECD expert on economic impact of ageing, examines the the rapid growth of the elderly population in many nations — and what might be done to help alleviate some of the looming costs. As populations age and require expensive health care, we must find cost-effective ways to deliver it. 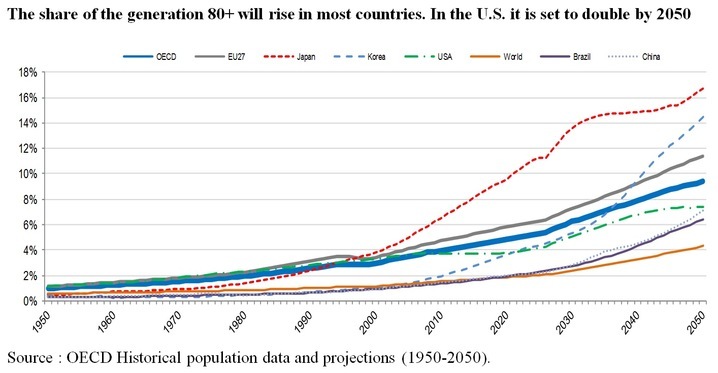 By 2050, more than 32 million Americans will be over the age of 80, and the share of the 80-plus generation will have doubled to 7.4 percent. 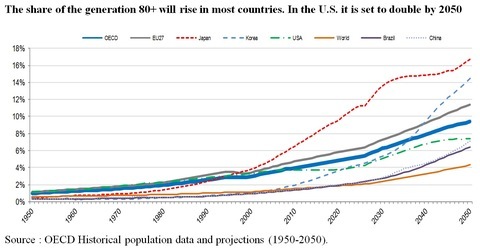 Across the 34 OECD countries, the share of people over the age of 80 is projected to grow even faster, from 4 percent today to almost 10 percent in the same time period. While more and more elderly people will still enjoy active, healthy lives and contribute to society, many are likely to have at least one chronic condition. Today, three out of four Americans aged 65 years and older have to cope with health concerns such as cardiovascular disease, diabetes, cancer or chronic respiratory diseases. The biggest impact will be on their families. Across OECD countries, more than one in 10 adults over the age of 50 takes care of aging family members. Almost two-thirds are women, and their work is usually not paid. These family caregivers are the backbone of any care system for elderly. In the U.S., the economic value of their service is estimated at $350 billion a year. However, family caregivers who spend at least 20 hours per week taking care of a relative are less likely to have a paid job and hence are more likely to be poor when they retire. They also run a high risk of developing mental health problems because of the stress of caring. Counseling, the possibility of taking a break and flexible work arrangements would help the families, employers looking for skilled and reliable workers and tax-payers who would otherwise have to finance professional health care services. The growing number of elderly will also impact health and social care services. Expensive medical services such as diagnostic procedures, treatment of chronic conditions and hospitalization, combined with the cost of care services, will further strain both government and family budgets. The OECD estimates that public cost of providing care to the old and frail will more than double — to 3 percent of GDP in 2050 — driven largely by the cost of recruiting qualified personal. It is difficult to recruit workers to care for people with disabilities or chronic illnesses and even harder to keep them. In the U.S., more than two-thirds of home-health aides stay less than two years, and 70 percent of certified nursing assistants change jobs every year. The direct cost of this turnover is huge — some $2,500 per worker. With the demand for care workers set to double by 2050, pressure on wages will rise, leading to even higher costs. To address this challenge, countries should take a three-prong approach: They should invest more in improving the quality of care and preventing the need for care. Regular exercise, combined with sufficient calcium and reducing hazards in the home can mean fewer broken bones. Among people over 65, falls — many of them preventable — are the most frequent cause of injury and hospital admissions due to trauma. The medical costs of falls in the U.S. represent an estimated $30 billion annually. A second strategy would be to encourage people who suffer from disabilities to continue to live in their homes, with a higher quality of life and lower costs for the health care system. Across OECD countries, only one-third of dependent elderly people live in residential care homes but they account for almost two-thirds of the costs. And lastly, staying active as long as possible is important, but when health fails, social systems should have a responsibility to pick up the extra costs. Because the pensions of even those in the middle class might not be sufficient to cover costs for care, sharing the burden is important. In addition to public systems, most OECD countries provide help for elderly in need of care, developing a private market with simple insurance products is also important as cost pressures continue to rise.